A soft spot on the patio with the sun shining through golden trees. Hot chocolate or a Diet Coke. And a little extra time to enjoy. Do my days look like this? Heck no but a girl can dream and look forward to those wonderful fall days!! I really enjoyed having a Summer Reading List so I've created a new list for fall. Pure fun....that's what on this list and I can't wait to dig in! I don't have a Fall reading list but it sounds like a good idea! I only read non fiction for some reason ( I'm kind of weird like that ) but always have a couple I'm in the middle of at the same time. Your list looks enticing however! I usually read whatever Steve has just finished, but any book with Doris Day in the title sounds fun! I seldom find time to read. Too many projects and I find when I get into a good book, all else falls by the wayside until I get through it, so I try not to go down that rabbit hole too often! I am reading a book right now called Sweet Salt Air by Barbara Delinsky. It is about a food blogger who is writing a cookbook. I curled up with a book yesterday and floated around the pool in my sweatpants! A big float so that just my toes got wet was the perfect place to read! I'm always excited to find some new titles to read! These sound wonderful--thanks for the ideas! I'm adding these to my list. Merry Muffin Mysteries...I love books like that. Have you ever read any of Diane Mott Davidson's books? Her main character is Goldie, a caterer, and she shares some wonderful recipes in her books! My Daughter just got me a set of books for October. She knows I love to read scary ones in that month. I am not sure I will be able to finish these anytime soon. They are so big. HA! HA! What I don't finish I will save for next year. I have read a couple of Maeve B books...and like them. I have been meaning to read Michael Lee West's books. I need to get with it! Hi Stacey, your reading list sounds interesting and I hope you get to sit on the patio and enjoy the fall days. I really don't have a list yet, but I will and it will also include some decorating books too. I am currently reading A Fine Romance by Susan Branch, We're Just Like You Only Prettier by Celia Rivenbark, and Villette by Charlotte Bronte. Villette is the only novel by Charlotte Bronte that I have yet to read. I do love to read cozy mysteries and Maeve Binchy is a long time favorite of mine. Lovely idea, a reading list. I hope to get caught up on reading in the winter months ahead. I've read A Week in Winter and it's a great book; but anything Maeve Binchy wrote was superb in my opinion. Must check out the other books. Thank you for the suggestions. I'm always looking good books to read. You've got a great list! A blog friend just sent me a book that she thought I might want to read before going to New England Oct. 11th. Getting ready to read The Rosie Project, light funny read. I've jotted down a couple of those titles. I couldn't get into the book I was currently reading, and your titles all sound so interesting so I'll try one of your suggestions. Hi Stacey! Sounds like a bunch of good books! I read more while we were on our trip. Read the new Harper Lee book too. I'm still thinking about that one. Do you read everything simultaneously? Do you prefer books or electronic books? I just can't seem to read long on my Nook. Maybe I need to go back to old fashioned books. Looks like a great list. I look forward to hearing how you like these books. All of these sound wonderful! I love fun light reads. PS Sorry you didn't get to paint your door. :-( HOA's can certainly cramp your style. Maybe paint the inside of your door? That might be fun. Well, I brought some books with me to Sacramento to read while my daughter and new baby nap. I am really in to Rosamunde Pilcher novels right now-reading the Shell Seekers and loving it. 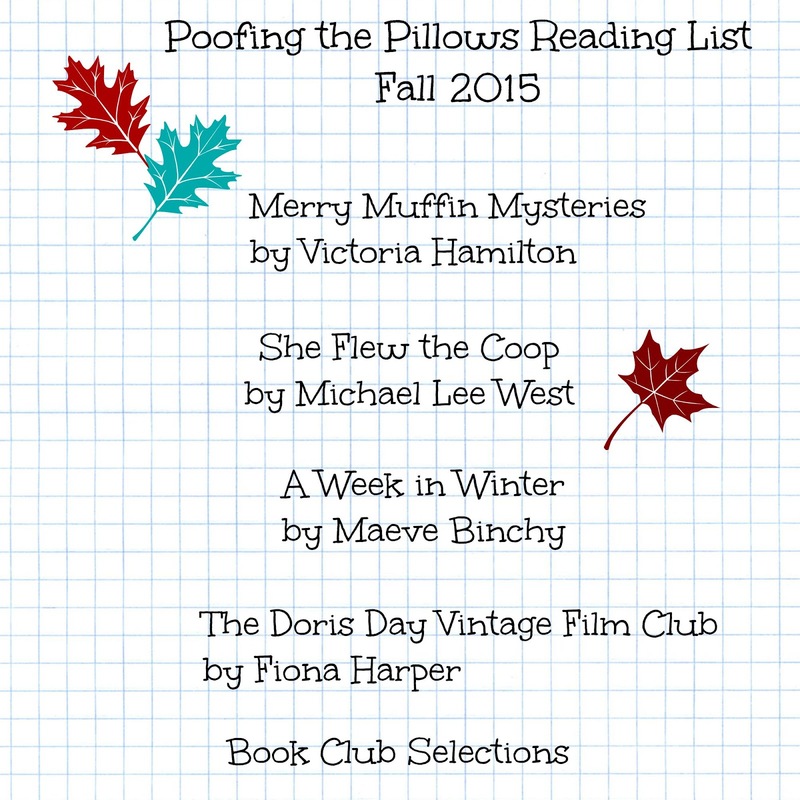 Your Fall reading list sounds lovely. OMGoodness....I want to read The Doris Day Vintage Film Club. I think I'd love it!!! Let me know if you like it or not. Enjoy your cruise! I suppose you've already left. I love your post...NRA neighbors and alarm system, LOL! Thanks for the list Stacey! I used to be a children's librarian and I so miss getting to read new books before they went on the shelf. I am always looking for something new to read. Can't wait to try these.